Can we make aluminium bronze at revspace? 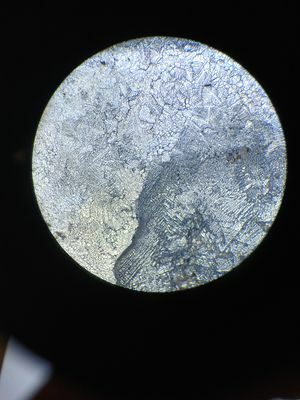 10X magnification of one aluminium casting that was poured. Attempt no landings here. Used steel wool as soruce of Fe, hoping for fast dissolving in Al. Does not work well. Tried wrapping in alu foil, in tight packets. Sort of ok, but very, slow to dissolve, borax get in everywhere , mess. Next time either skip Fe, or try shavings from a file of drilling swarf. Current crucible handlling tools are inadequate for the oven. Pouring rings should be custom made for each crucible type, to ensure maximum stability. Make sure handles are easy to pick up then ring lays flat on the table or floor. A ceramic ring/plate system for stabilizing the crucibles, and reduce risk of tipping over, maybe some form of splash tray. As long as you are not reaching into the oven, welding gloves, face shields, leather aprons + flame retardant overalls are ok. This page was last modified on 4 June 2018, at 13:02.